The Korean Peninsula has been having erroneous weather forecast for a Month where Annual Monsoon is delayed, all-the-while the whole nation going-through horrendous heat-wave for a Week now . surprisingly each day’s news announce tomorrow will be more hot ! and today the hottest so-far, with Southern in-land regions hitting body-temperature of 36 degrees Celsius . ofcourse no surprise if you are from main-land China where it gets even hotter, with cheaper bus without air conditioning . actually both bus and subways have strong air conditioning, but subway stations are boiling so it is much better if you can take bus routes . but the real heat-wave hits animals whose body temperatures are higher, and rural chicken and pig farms are going through daily death in the mass . and this affects our pets too, but some technological products to save the few-more-days . 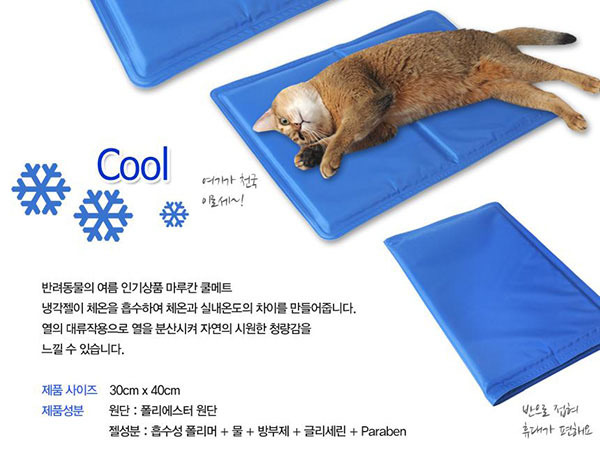 Marukan and Gonta Club are model lines of a Korean brand that exports cooling pads – made of temperature responsive and regulating gels, plus Hipidog Love (wooden sheets) for pets – to neighboring Japan . note there are much larger cool mats sold for humans resembling full-fledged blankets and mattresses, but buying a couple of these for pets work better as your body don’t really need all the rest of the large area, plus some folding Marukan models (in photo below) are on sale at half the price from their usual W10,000 each ! These work by absorbing body heat, while the body absorbs coolness from the gel inside . in my experience : bracing on it for 10~20 minutes work best, after which you will feel wonderously refreshed for an hour or two without it . it has to be this way, as the pad (called mattu in Korea, and matto in neighboring Japan) soon becomes the same temperature as your body, unless it is large with much unaffected areas, where it can relinquish cooler portions from . furthermore it works best when pets or humans lie on it horizontally, than sit on it vertically for heavy portions will leave not room for gels below you . in numbers : manufacturer say it lowers 6 degrees Celsius, while vendors atest these made for pets won’t leak, but some buyers comments say other-wise .